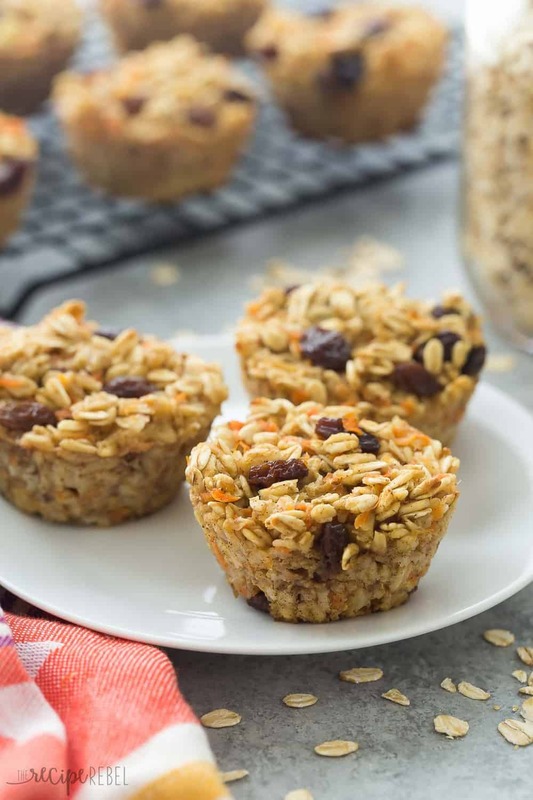 These Carrot Cake Baked Oatmeal Cups are super simple — a great on the go breakfast, lunch or snack! Packed with fiber and protein and low in calories. So. I know you probably don’t know this, but I (Hello! Ashley from The Recipe Rebel here) have a wee obsession with baked oatmeal. It’s not only an easy breakfast to make and stash in the fridge or freezer for the week, but I would also probably eat it for lunch, dinner and snacks as well. It’s just so good, friends. I have never really been a big oatmeal person. I always found it too mushy, and I just didn’t love the taste or texture. But once, maybe 6 months ago, I made some baked oatmeal and I’ve never looked back. It’s changing the breakfast game for us! 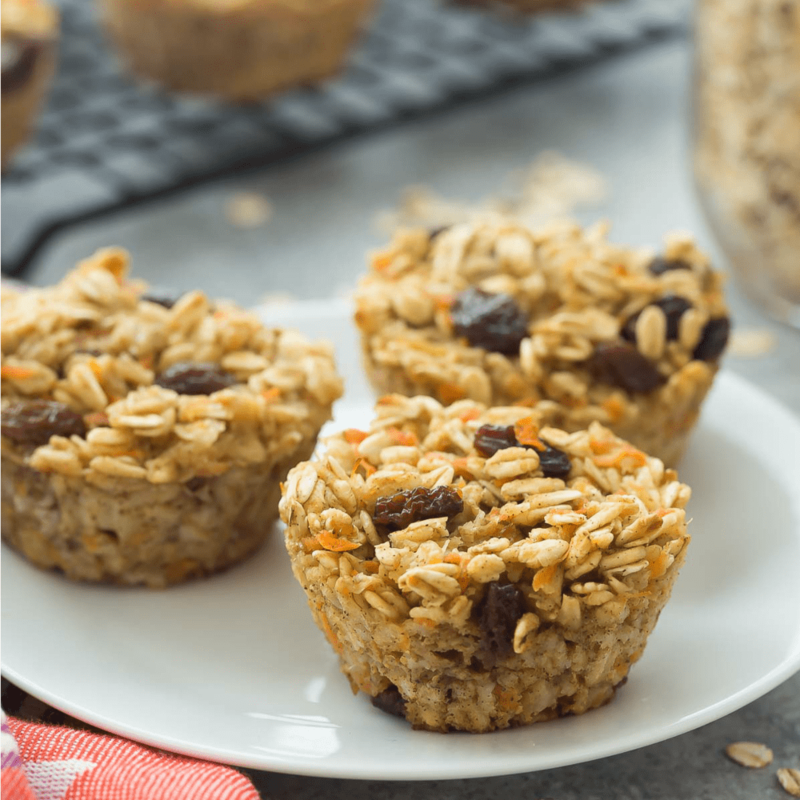 Since then I feel like I’ve made these Baked Oatmeal Cups about 100 times, and they haven’t gotten old yet. All we do is mix up the things we throw in them — bananas, apples, peanut butter, berries — you name it! My kids love to just pick them up and eat them as muffins, but I like to get mine nice and hot and pour some milk over, as you might with regular oatmeal. I mash it all up and it’s just like your usual bowl of oatmeal, except 100x better. It keeps its chewy texture after baking, even if you douse it in milk and it doesn’t get mushy at all. 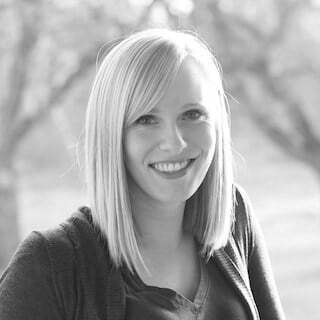 It’s healthy and totally customizable! Anyway. I’m sure my obsession is clear by now! 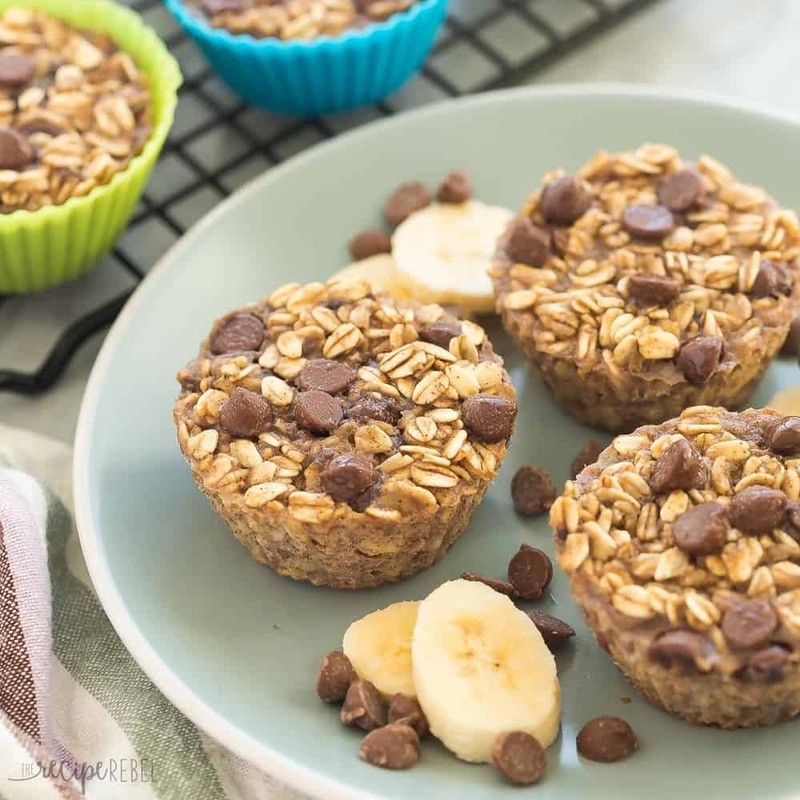 These cups are good warm or at room temperature and really pack quite a punch of protein and fiber in just a few little bites. Basically, my perfect food! 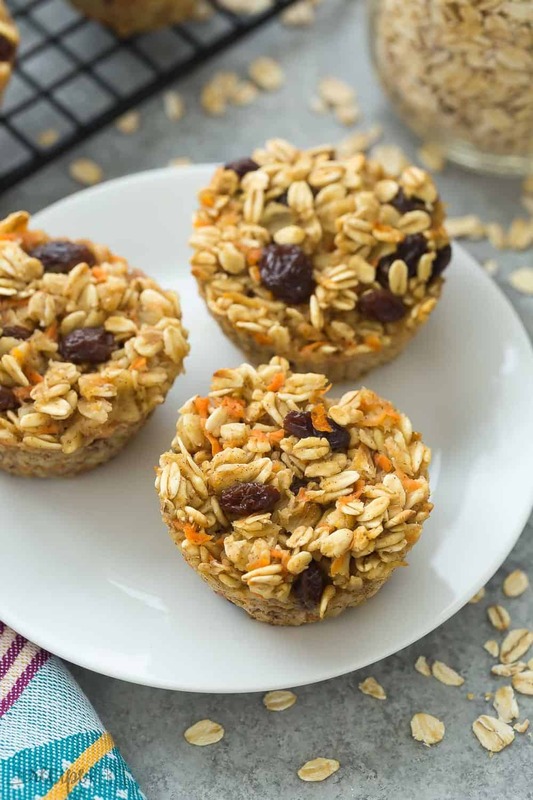 These Carrot Cake Baked Oatmeal Cups are super simple -- a great on the go breakfast, lunch or snack! Packed with fiber and protein and low in calories. Preheat oven to 350 degrees F and line a baking sheet with 15 silicone muffin cups (or grease a regular muffin pan well!). In a large bowl, stir together milk, egg, sugar, vanilla, cinnamon and nutmeg. 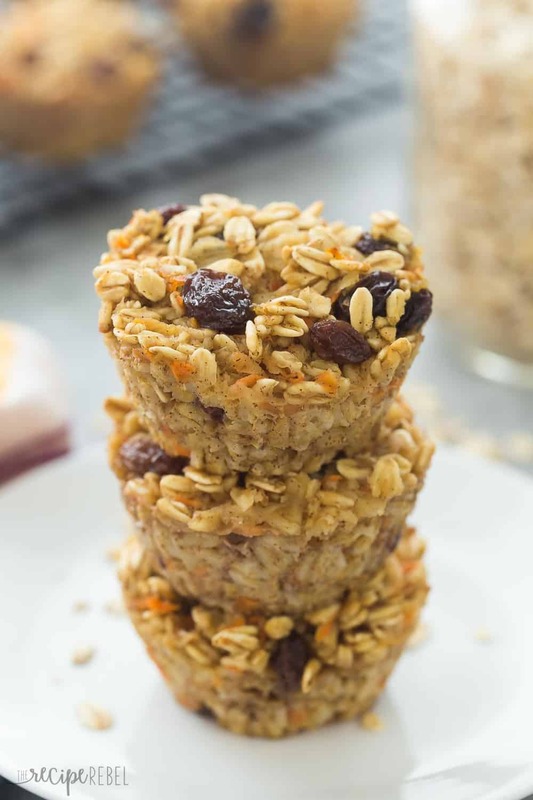 Stir in oats, carrot, pineapple and raisins or other additions if desired. Divide evenly between 15 muffin cups and bake for 30 minutes, until set and golden brown on top. Let cool completely and store in the refrigerator for 6-8 days or in the freezer for 3 months. Serve warm by themselves or in with milk. I made these tonight, delicious! Mine seem to be more moist than yours, perhaps I needed more pineapple and less of the juice. I’ll try that next time. These look so good! 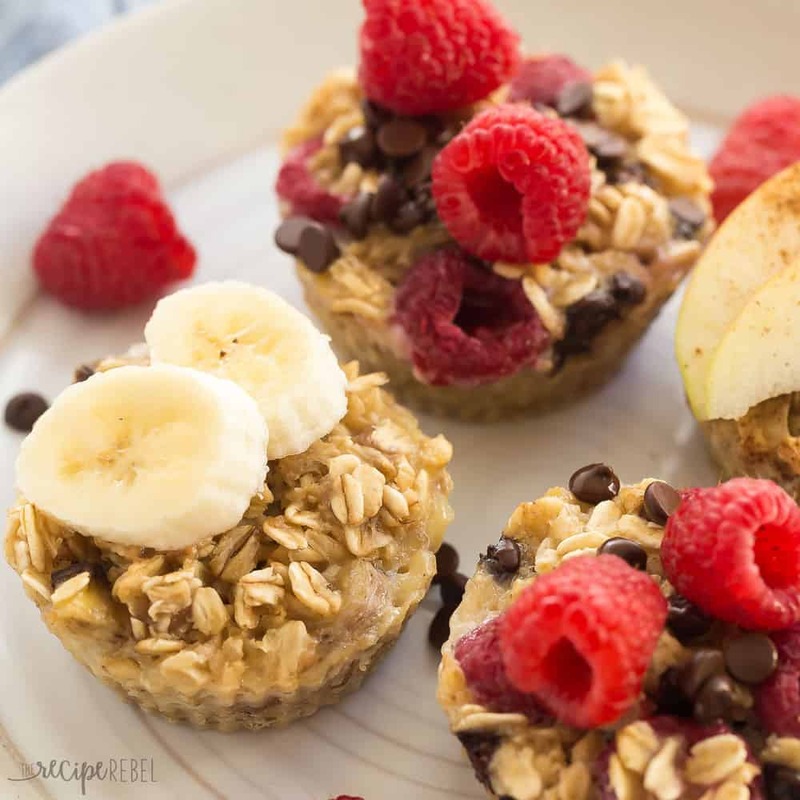 We are always looking for quick and healthy breakfast ideas to grab and go! Can’t wait to try them. Thanks! Made these last night. Turned out perfectly. The only difference is that I added 1/2 cup of ground almonds. Great treat for any time of day. Simply delicious. I am so glad the recipe worked out well for you! I love almonds!! That is a great idea! Thanks for sharing! !